As we’ve all heard growing up, breakfast is the most important meal of the day. Cereal and toast with jelly are good options when you don’t have a lot of time to spare, but there’s a whole world of crockpot breakfast recipes you can try, including crockpot breakfast casserole. French toast or a breakfast casserole both sound yummy, but instead of pre-heating your oven and standing over the stove for what seems like ages, consider your slow cooker! All you need to do is dump in your ingredients and then go enjoy your morning with the kids. While you’re sipping coffee and getting ready for the day, you’ll start to smell the incredible aroma of your slow cooking breakfast. Break out of the mindset that this appliance is only good for soups, potatoes, or meats. You’ll be amazed when you see how a crock pot can start your morning off right. Oatmeal, cinnamon rolls, frittatas, and many other 18 Delicious Crock Pot Breakfasts recipes will make enjoying a warm and hearty breakfast, a breeze. by Pink- Easy Crockpot Breakfast Casserole | A savory dish that will give you that salty vibe from the bits of bacon, bread, eggs, and more. It is the ultimate breakfast option. 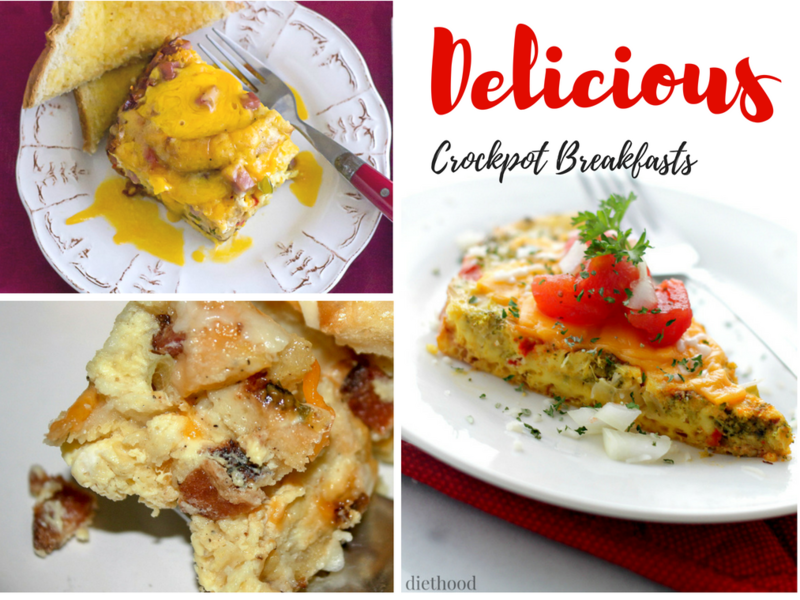 Flour on My Face – Crock Pot English Muffin Breakfast Casserole | A breakfast casserole that can be tossed in the crockpot and a few hours later it is ready. Ham, eggs, English Muffins, and more go into this satisfying breakfast. Penny Pincher Jenny – Crock Pot Cinnamon Rolls| If you didn’t know you could make cinnamon rolls in the crockpot you are missing out. A quick and easy way to make perfectly light rolls to serve up your family and guests this weekend. Diethood –Slow Cooker Veggie Omelette| Veggie omelets are a must, but if you are like most and struggle with making a perfect omelet, try this crock pot version. Super easy and you get that omelet taste you are hoping for. Veggie and protein-packed. The Spring Mount 6 Pack – Crock Pot Eggnog French Toast with Maple Creme Syrup| This eggnog French toast truly tastes like the holiday season. If you are a fan of french toast, this one is a must. Perfectly cooked eggnog flavored French toast with a maple creme syrup that will blow your mind. The Gracious Wife – Crockpot Overnight Breakfast Casserole| Toss the ingredients in before bed and wake up to breakfast waiting for you. Your home will smell amazing and your family will thank you for a homemade breakfast. Hashbrowns, sausage, bacon, cheese, and the list continues. Homemaking Hacks – Slow Cooker Spicy Egg and Cheese Breakfast Casserole| Kick up your breakfast routine with a little spice. If you like some heat to your morning, try this spicy egg and cheese casserole. It is so simple to make and packed full of vibrant flavors. Don’t forget your milk to sip on! Sweet and Savory Food – Crock Pot Caramel Pecan French Toast| If you have a sweet tooth you have to try this caramel pecan version of French Toast. You get that crunch from the pecans, paired with tender French toast that has caramel throughout. These are so divine. Julie’s Eats and Treats – Crock Pot Peanut Butter Banana Oatmeal| I love a good hearty bowl of oatmeal. If you are a fan as well, try this version. You have protein from the peanut butter, banana for added potassium, mixed with your hearty oats. A very filling breakfast the whole family will love. Recipes That Crock – Crock Pot Blueberry Breakfast Casserole| Blueberry casserole that is bursting with vibrant blueberry and nut flavor. You can make this casserole in the oven or crock pot. Either way, you and your family will enjoy it, I am sure. Apple of My Eye – Healthy Crock Pot Breakfast Casserole| A super think layered casserole that is jam-packed with veggies is a perfect kick-start to your day. Get in the nutrients you need to fuel your body with this healthy casserole. Diethood – Crock Pot Creamy Banana French Toast| This french toast is completely loaded with baked bananas that offer that bold banana flavor in every single bite of your french toast. Then if you want even more flavor, add some freshly cut bananas over the top before serving. Recipes That Crock – Crock Pot Cheese Souffle| Five minutes is all it takes to prep this souffle recipe! It is quick and easy and highly rewarding once you sink your teeth into this cheesy and egg souffle. Skinny Ms – Slow Cooker Spinach and Mozzarella Frittata| Nothing can beat a good frittata in my books. A spinach and mozzarella create that earthy and cheesy frittata that will leave all your guest asking for the recipe. But what makes it even more delicious is the toss it in your slow cooker, and forget it aspect. 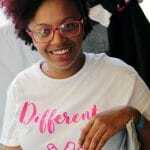 A Night Owl Blog – Crock Pot Pumpkin Coffee Cake| If you love pumpkin try out this coffee cake. You have that pumpkin spice flavor that burst within each bite. Four ingredients is all you need for this coffee cake recipe! The Gracious Wife – Crock Pot Apple Oatmeal| Tender bits of apples in each bite of your hearty bowl of oatmeal. Then you have the mix of spices that almost give this an apple pie element of flavor. Sugarfree Mom – Crock Pot Mexican Breakfast Casserole| We love Mexican and this breakfast casserole offers those perfect Tex-Mex flavors that our family devours. Serve this up for a weekend breakfast or a treat to break up your work week. Moms With Crock Pots – Bacon and Cheese Quiche in a Crock Pot| Bacon, cheese, and eggs are meant to go together. You can make a quiche that doesn’t get any easier than this crockpot version here. Julie’s Eats and Treats – Crock Pot Tater Tot Egg Bake| Prep this and toss in your crock pot the night before and wake up to a perfectly cooked egg bake. Starchy tater tots, eggs, cheese, and more! Your family is sure to reach for seconds. 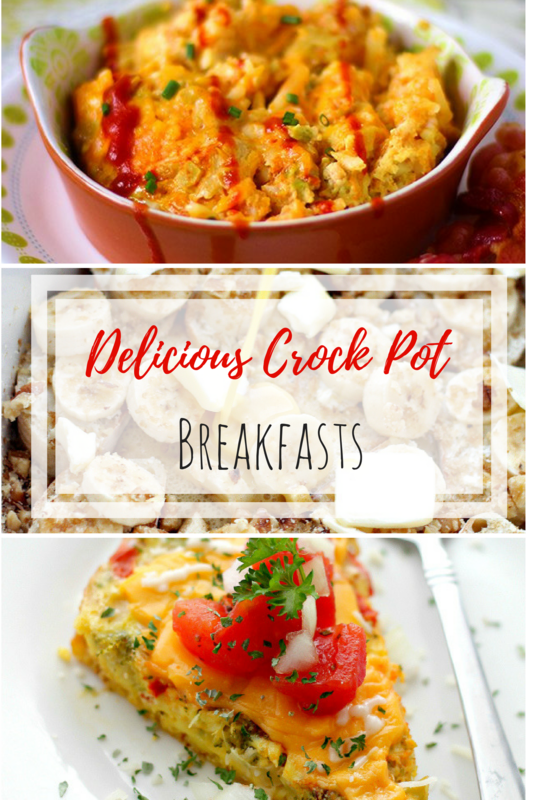 If you have enjoyed these crockpot breakfast recipes, make sure to sign up for email so you don’t miss the next great post! 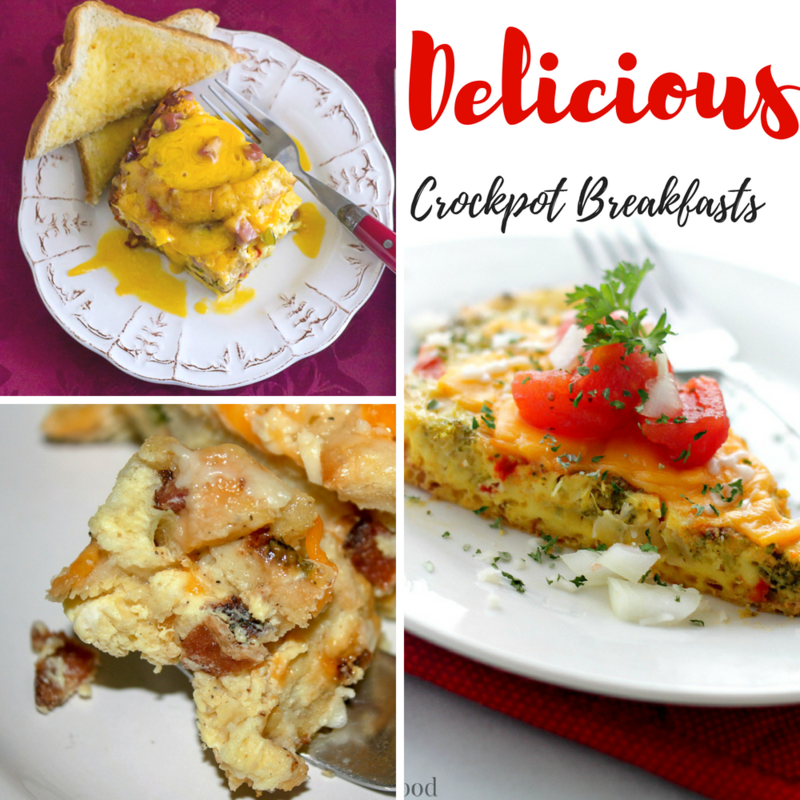 Thanks for sharing my Crock Pot English Muffin Breakfast Casserole recipe!